The Evangelical Covenant Church confesses that the Holy Scripture, the Old and the New Testament, is the Word of God and the only perfect rule for faith, doctrine, and conduct. In response to the call of God and in unity with the whole Church, the purpose of the Evangelical Covenant Church is to make known the good news of saving faith in Jesus Christ, to encourage a Christlike life among its congregations and their members, and to carry out Christ's redeeming work of love, mercy, and justice in the world. 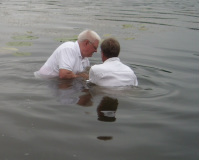 When new members join a Covenant church, they are asked two questions about belief: “Do you confess Jesus Christ as your Savior and promise to follow him as Lord?” and “Do you accept the Holy Scriptures, the Old and New Testaments, as the word of God and the only perfect rule for faith, doctrine, and conduct?” They are then asked if they intend to live as faithful followers of Christ and members of the church and denomination.That’s all. That is enough.